I’m sure anyone who has had children, or has had reason to spend some length of time in a hospital would agree with me when I say that it’s like living in a bubble. Time in the outside world seems to stop. Everthing that is happening is entirely focused on your new child(ren). All of your normal worries over bills, work, politics, the red threat, global warming and to-do lists seem to disappear as you gaze into the eyes of your new arrival(s) and wonder where the heck they came from. Well, I mean, you know where they came from – chances are you had a pretty active role in their conception. I’m just saying that all of a sudden, you have these bundles in your arms who rely on you for absolutely everything and they look at you with those, eyes. As I said in my previous post, the girls have been spending their time in the special care nursary at the Calvary. This means that we get to change them and hold them while they feed through their nasogastric tubes. If we’re really lucky, we might actually get to give them a bath. As fantastic as the care at Calvary has been, I can’t wait to get my children home so we can work out how to be a family. At the moment it seems that all we’re doing is babysitting our own children. Well, I’m officially a Dad! It has been said that I’ve technically been a Dad since the girls were first conceived, the rationale being that their care and welbeing has been a priority for me since then. I agree, but it’s tough to feel like a Dad until you’ve got a (or two) little bundle(s) in your arms turning you into a smiling, blubbering, happy, girly mess. The reasons for my being a mess are the two little bundles that I referred to above. Layla Kate and Elsa Jean Imms were born on the 24th of December at 7:22pm and 7:23pm respectively. 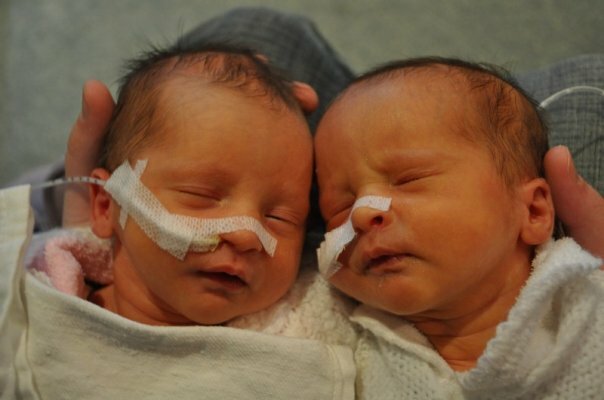 They were born 5 weeks early, meaning that they are currently spending their time feeding and sleeping in the Special Care Nursery at Calvary Health Care Tasmania. They’ve been there since they were born, and as you may have guessed this means that we are home without them. It’s really hard to come home each night without our new little additions. It’s odd – it’s not like we’re used to there being two kids around the place, but they’re born now. We’ve been bonding. Leaving them behind at the end of the day is one of the hardest things I’ve ever had to do, and I have to do it every single day. On the upside, Layla and Elsa are awesome. They’re cute, floppy, noisy, smelly and beautiful. We’re not sure whether or not they’re identical as the test results haven’t come back yet. All I know is that they’re my daughters and now I’m soppy. I should also note that the staff at the Calvary have been incredible. I can’t recommend them highly enough, if you’ve got or are thinking about getting health insurance, it’s worth it. There is one particular midwife that has been absolutely awesome. If you come across Gina in your travels, tell her that the Imms’ say hello.